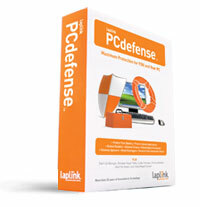 Laplink PCdefense protects PC by detecting, preventing and removing spyware, crimeware, malware, keyloggers, rootkits, viruses, and other stealth applications. Laplink PCdefense has a unique feature, the Disaster Recovery module that allows recovery of entire system – programs, settings and files – in the event of catastrophic attack or system failure. Good points for Laplink PCDefense are it targets spyware and rootkits, two areas that traditional antivirus and Internet security suites don’t, and includes a disaster recovery option. However, PCdefense lets down on relies on on-demand antivirus protection, a process that won’t catch rapidly spreading viruses and worms; the app doesn’t include a firewall and antispam blocking, and many of its tools are already available for free within your browser or in Windows XP.